For other uses, see Stepney (disambiguation). The first community developed around the church of St Dunstan's, which was founded in 923. Its name was recorded around 1000 AD as Stybbanhyð, "Stybba's landing-place". The Domesday Book survey of 1086 gives the name as Stibanhede and says that the land was held by the Bishop of London and was 32 hides large, mainly used for ploughing, meadows, woodland for 500 pigs, and 4 mills. There were over 100 serfs, split between villeins who ploughed the land, and cottars who assisted the villeins in return for a hut or cottage. Bishop William held this land in demesne, in the manor of Stepney, on the day on which King Edward was alive and dead. In the same vill Ranulph Flambard holds 3½ hides of the bishop. The Manor of Stepney was held by the Bishop of London in compensation for his duties in maintaining and garrisoning the Tower of London. Further ecclesiastic holdings came about from the need to enclose the marshes and create flood defences along the Thames. Edward VI passed the land to the Wentworth family, and thence to their descendants, the Earls of Cleveland. The ecclesiastic system of copyhold, whereby land was leased to tenants for terms as short as seven years, prevailed throughout the manor. This severely limited scope for improvement of the land and new building until the estate was broken up in the 19th century. In the early 20th century, Stepney was one of the most Jewish neighbourhoods in England; it was eventually replaced by Stamford Hill. The Siege of Sidney Street took place in Stepney in 1911. As with the whole of Greater London, the Lord-Lieutenant Ken Olisa is the Her Majesty's representative for Stepney but has no political role or hold an office in any political party and is purely an honorary titular position. Stepney is in the constituency of Bethnal Green and Bow, represented in the House of Commons of the UK Parliament since 2010 by Rushanara Ali of the Labour Party. London overall has a directly elected executive Mayor of London, currently Sadiq Khan and the City and East seat in the London Assembly is held by Labour Party Unmesh Desai. Tower Hamlets London Borough Council is the local authority and also has a directly elected executive mayor, the Mayor of Tower Hamlets John Biggs, Stepney has local councillors from three wards, St Dunstan's, Bethnal Green and Stepney Green. Stepney formed a large ancient parish in the Ossulstone hundred of Middlesex; bounded by Bromley and West Ham to the east, the River Thames to the south, Shoreditch and Hackney to the north and the City of London and the Liberties of the Tower of London to the west. The parish included the hamlets of Mile End Old Town, Mile End New Town, and Ratcliff. At its early extent it additionally included Whitechapel, Wapping, Stratford Bow, Shadwell, Spitalfields, Bethnal Green, Limehouse and Poplar. Over time the parish was broken up with these settlements forming new independent parishes, leaving a residual parish of 830 acres (340 ha) comprising Mile End Old Town, Mile End New Town and Ratcliff. The Metropolitan Borough of Stepney was formed in 1900, then dissolved in 1965 when it was absorbed into the newly created London Borough of Tower Hamlets which currently administers the area. Stepney is located 3.6 miles (5.8 km) east north-east of Charing Cross. It is roughly bounded by Shadwell between the London, Tilbury and Southend Railway between Limehouse station and the immediate area around the north-side of Shadwell DLR station, it reaches the north bank of the River Thames in a part of Stepney known as Free Trade Wharf. The various side streets that make up the boundary between the E1/14 postcode is considered to be the division with Limehouse in the south, part of the Great Eastern Main Line (GEML) with Bethnal Green and the southern leg of Bancroft Road forms an borderline with Mile End due to both a hospital of the same name and Queen Mary University. The western boundary with Whitechapel is Cambridge Heath Road and Sidney Street. The Stepney Community Trust, a community led charity with a long history of local action, was set up in 1982 as the St Mary's Centre to respond to the severe levels of housing and social deprivation existing in the area. The name was later changed to Stepney Community Trust. Stepney City Farm also provides a number of community services, such as guided tours, workshops and other activities. The Stepney Historical Trust was set up in 1989 to advance the public's education in the history of Stepney and the surrounding areas. It is based in the London Dockers Athletic and Social Club and has installed a series of plaques on sites of historic interest. Jewish Care was created in 1990, through the merger of two previous charities to ensure they can care for the community needs in the most cost-effective way in order to maintain their vision of high quality care in Stepney and is based at the Brenner Centre in Raine House. The City Gateway Women Programmes provides opportunities for local women in Stepney to gain independence, grow in confidence and access employment and develop skills in a supportive community environment. Due to the availability of cheap housing, the East End of London and London Borough of Stepney has been home to various immigrants who have contributed to the culture and history of the area, such as the French Huguenots in the seventeenth century, the Irish in the eighteenth century, Ashkenazi Jews fleeing pogroms in Eastern Europe towards the end of the nineteenth century, and the Bangladeshi community settling in the East End from the 1960s onwards. The area still contains a range of immigrants, particularly young Asian families, as well as elderly East Enders, some students, and the beginnings of a young middle-class. Based on the 2001 UK Census, Bangladeshis were the largest ethnic group (43%), followed by White British (39%). The 2011 UK Census revealed that 47% of the population was Bengali; the highest percentage of Bengalis in Southern England. The Church of England St Dunstan's, founded in 923, is Stepney's oldest church. The present building dates principally from the 15th century. St Dunstan's has a long association with the sea, being responsible for registration of British maritime births, marriages and deaths until the 19th century. Stepney is an episcopal area in the Anglican Diocese of London, which covers the London boroughs of Hackney, Islington and Tower Hamlets, and has its own suffragan bishop. Stepney City Farm has been a feature in Stepney since opening as Stepping Stones Farm in 1979. A community resource, the farm aims to provide the people of East London a chance to experience rural life and engage in educational, environmental and creative projects. Stepney City farm is home to donkeys, cows, goats, pigs, sheep, ducks, geese, chickens, rabbits, ferrets and guinea pigs. As a working farm, eggs and vegetables are regularly sold. "Clear brain and sympathetic heart, A spirit on flame with love for man, Hands quick to labour, slow to part, If any good since time began, A soul can fashion such souls can." The Malplaquet House is a Grade II listed building. The streets of Stepney have supposedly been subject to a number of incidences of paranormal activity. One rumour is that a cloaked and shambling figure, alleged to be an old pedlar who drowned in old Stepney Marsh after being mugged, is frequently seen roaming the streets to the south of Stepney Green tube station. Stepney Green developed as a street of residential housing off the Mile End Road in the 15th century, and is now a district in it own right. A brewery was founded in 1738 that developed into Charrington and Co. in 1897. The brewery building, the Anchor Brewery, was on the north side of Mile End Road, opposite Stepney Green; and is now the site of the Anchor Retail Unit, owned by Henderson Global Investors, though the Brewery Offices still remain on the corner of Mile End Road and Cephas Avenue. Stepney F.C. is a non-league association football team which currently plays in the Tower Hamlets-based Inner London Football League. The district's Senrab Street gave its name to Senrab F.C., a youth team now based in Wanstead Flats and notable for producing many future professional players. In the northern part of the district which is known as Stepney Green, is the station of the same name on the Hammersmith & City and District lines on the London Underground. The area overall is covered by London Buses services, mostly west-east by the 25, 205, N205 on Mile End Roadand 15, 115, 135 and N550 on Commercial Road, the 309 and 339 via Ben Johnson Road. The Sir John Cass's Foundation and Redcoat Secondary School and Sixth Form College is a Church of England voluntary aided school that was opened in 1710 by Sir John Cass. See also: Category:People from Stepney. The English physician Richard Mead, responsible for advances in understanding transmissible diseases, was born in Stepney. The entertainer Des O'Connor was born in Stepney, as were actors Steven Berkoff, Terence Stamp and Craig Fairbrass, playwright Arnold Wesker, gardener and television presenter Rachel De Thame, television executive, presenter and former BBC1 and BBC2 controller Alan Yentob, artist Frank Paton, drummer Kenney Jones, musician and writer Jah Wobble, singer/record producer Kenny Lynch and his sister, also a singer, Maxine Daniels, also singer Charles Coborn. Footballers Ledley King, Ashley Cole, Mark Lazarus, and Darren Purse were born in Stepney, Heavyweight boxer "Bombardier" Billy Wells and former armed robber, bare-knuckle boxer and businessman Roy Shaw were born in Stepney, as was former British featherweight boxing champion Sammy McCarthy, and sportswriter and author Norman Giller, whilst clergymen John Sentamu, formerly Bishop of Stepney, and Father Richard Wilson, founder of the Hoppers' Hospitals at Five Oak Green, Kent, lived in the borough at one time. Actors Bernard Bresslaw, John Lyons, Ben Onwukwe and Roy Marsden were born in Stepney, as was EastEnders actress Anita Dobson. Danny Shea, the first footballer to be transferred for £2,000, was born in Wapping in 1887. Monty Norman (The composer of the James Bond theme) and Lionel Bart known for creating the book, music and lyrics to the production Oliver! were also born in Stepney. Referenced in the Rolling Stones song, "Play with Fire", released in 1965. Stepney is used as an indicator of a character's descent from privilege. In her 2002 memoir Call the Midwife, Jennifer Worth writes a graphic account of 1950s Stepney at the height of its urban decay describing bombsites, condemned buildings, filth, and rampant prostitution. ^ a b c Christopher Hibbert; Ben Weinreb (2008). The London Encyclopaedia. Pan Macmillan. p. 877. ISBN 1-4050-4924-3. Retrieved 20 May 2010. ^ a b "Hot neighbourhoods: Stepney, E1 – Time Out London". www.timeout.com. Retrieved 19 May 2010. ^ Jones, Catherine (27 September 2001). "Immigration and Social Policy in Britain". Routledge – via Google Books. ^ "Her Majesty's Lord-Lieutenant of Greater London". ^ "Rushanara Ali MP". UK Parliament. ^ a b T.F.T. Baker (1998). "Stepney: Early Stepney, A History of the County of Middlesex: Volume 11: Stepney, Bethnal Green". ^ "welcome". Stepney Community Trust. ^ "London Dockers Social & Athletic Club". Tower Hamlets. Retrieved 28 November 2016. ^ "Stepney Historical Trust". Open Plaques. Retrieved 28 November 2016. ^ "Stepney Jewish Community Centre - Community - Jewish Care". www.jewishcare.org. ^ "City Gateway - Women's Programmes". home.citygateway.org.uk. ^ "The Jews - British History Online". www.british-history.ac.uk. ^ Services, Good Stuff IT. "St Dunstan's and Stepney Green - UK Census Data 2011". UK Census Data. ^ "Stepney Episcopal Area". The Diocese of London. Archived from the original on 30 August 2005. Retrieved 10 May 2007. ^ "MONTEFIORE". JewishEncyclopedia.com. Retrieved 2017-10-07. ^ "The Haunted Tube Map". 22 March 2017. ^ "Stepney – Communications". British History Online. Retrieved 21 May 2010. ^ "Anchor Retail Park – Scheme Overview on Completely Retail". www.completelyretail.co.uk. Retrieved 20 May 2010. ^ "Stepney FC". Inner London Football League. Retrieved 6 June 2017. ^ Alex (4 August 2005). "All Aboard". Londonist. Retrieved 5 June 2017. ^ "Stepney Green - Hidden London". hidden-london.com. ^ "Stepney Green Underground Station". Transport for London. ^ "Stepney Green Station". Transport for London. ^ "Stepney Methodist Church". Transport for London. ^ "Harford Street". Transport for London. ^ Jah Wobble, Memoirs of a Geezer, p. 1. ^ "The hoppers of Kent". BBC Legacies. Retrieved 21 December 2007. Bethnal Green is a district in the East End of London and is 3.3 miles (5.3 km) northeast of Charing Cross. 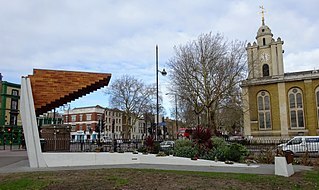 Bethnal Green forms the north-west part of the London Borough of Tower Hamlets and extends from the City fringe to Victoria Park with the south eastern side referred to as Globe Town, with Bethnal Green Road serving as the district centre. The area emerged from the hamlet which developed around the Green, much of which survives today as Bethnal Green Gardens. Bromley, commonly known as Bromley-by-Bow, is a district in the London Borough of Tower Hamlets in Greater London, South East London, located on the western banks of the River Lea, in the Lower Lea Valley in East London. It was historically was in the county of Middlesex until 1900. The area is distinct from Bow, which lies immediately north and east of the formal boundary between the two, which runs along Bow Road, or near the Lea, slightly to the south of the Road. The area has become better known as Bromley-by-Bow due to Bromley tube station being renamed to Bromley-by-Bow in 1967, to prevent confusion with Bromley railway station in the London Borough of Bromley. Over time the station's name has become applied to the district itself. The formal boundaries of the area were set when the area became an parish in 1537, when it split from Stepney. The boundaries of the new parish were based on those of much older pre-existing estates. Bethnal Green was a civil parish and a metropolitan borough in the East End of London, England. Shadwell is a district in East London, England, in the London Borough of Tower Hamlets, and is located north of The Highway and south of Commercial Road, it is between Whitechapel, Stepney and Wapping. It is located 3 miles (4.8 km) east of Charing Cross and forms part of the East End of London. Brick Lane is a street in the East End of London, in the Borough of Tower Hamlets. It runs from Swanfield Street in Bethnal Green, crosses Bethnal Green Road, enters Shoreditch then Spitalfields and is linked to Whitechapel High Street to the south by the short stretch of ‘’’Osborn Street’’’. Today, it is the heart of the city's Bangladeshi community and is known to some as Banglatown. It is famous for its many curry houses. Ratcliff or Ratcliffe is a former hamlet lying by the north bank of the River Thames. It now remains only as a street called Ratcliffe Lane in Stepney in the London Borough of Tower Hamlets and the old hamlet is now split between Limehouse and Stepney after being absorbed into both. 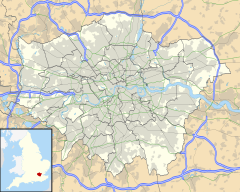 Mile End is a district of East London, England, 3.6 miles (5.8 km) east-northeast of Charing Cross. On the London to Colchester road, it was one of the earliest suburbs of the City of London and became part of the metropolitan area of London in 1855. In 2011, Mile End had a population of 28,544. Bethnal Green and Bow /ˈbɛθnl̩ ɡɹiːn ənd bəʊ/, /ˈbeθ-/, /ˈbɛfnəw ɡɹiːn ən bəʊ/ is a constituency in Greater London represented in the House of Commons of the UK Parliament since 2010 by Rushanara Ali of the Labour Party. Poplar and Limehouse is a constituency created in 2010. Since its creation it has been represented in the House of Commons of the UK Parliament by Jim Fitzpatrick, a member of the Labour Party. 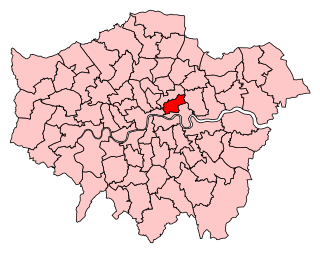 A list of the Districts of London located within the London Borough of Tower Hamlets. Elections to Tower Hamlets London Borough Council were held on 3 May 2018, the same day as other borough council elections in London. The directly-elected mayor of Tower Hamlets was also up for election.